Paris, France, between 1527 and 1530. Purchased on a grant provided by the Bernard H. Breslauer Foundation, 2011. 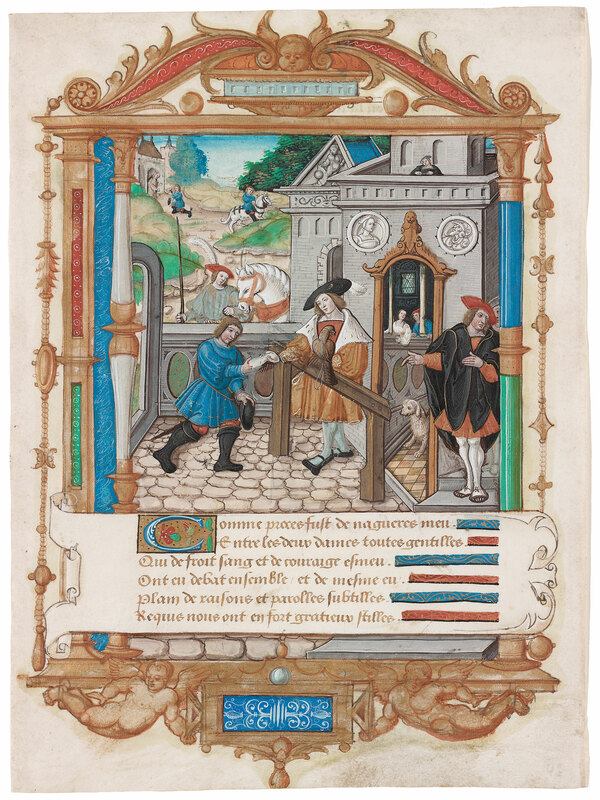 De Leclerc, a French dealer, in whose hands the manuscript (or the four miniatures?) was in an eighteenth-century black morocco binding; Henri Gallice, 1894, who had the codex's four miniatures bound and slipcased in red morocco by Saulnier; Marcel Jeanson, MS 112; his sale, Monaco, Sotheby's, 28 February-1 March 1987, lot 157 (Bibliothèque Marcel Jeanson: Première partie, Chasse); Bruce Ferrini and Sam Fogg (Akron, Ohio, Bruce Ferrini Rare Books, and London, Sam Fogg Rare Books & Manuscripts, Medieval & Renaissance Miniature Painting (catalogue written by Sandra Hindman), 1988, 68-73, 133-34, no. 34, illus. ); Ferrini/Fogg disbound the four miniatures and sold them separately. This leaf: Paris, Les Enluminures. Ms. single leaf written and illuminated in Paris, France, between 1527 and 1530. This miniature comes from the unique illuminated copy of Crétin's poem on hunting with dogs versus birds. Texts: recto: 11 lines of the end of section three; verso: 6 lines of the beginning of section four. Decoration: on the recto: 1 tailpiece; on the verso: 1 large miniature with architectural border. Artist: Master of François de Rohan. The codex originally contained four miniatures. The first miniature is in the Cleveland Museum of Art (acc. no. 91.157); the second and third are in an American private collection.